Atlantic View House in Killybegs, Co Donegal sleeps 4 people. 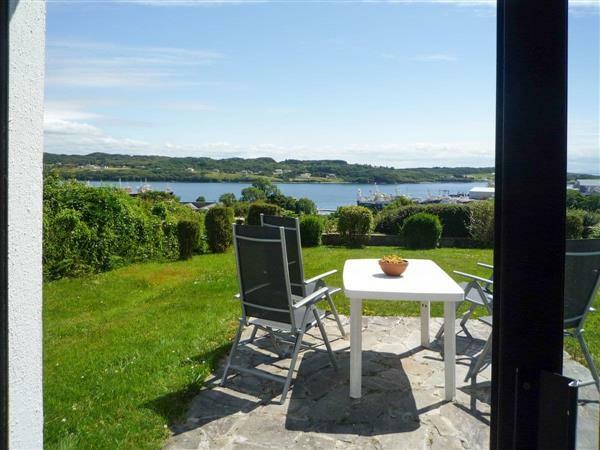 Situated in an elevated site, overlooking Killybeg’s harbour, this ground floor holiday apartment, close to the owner’s home, has a bird’s eye view of all it surveys. This area offers some of Ireland’s most stunning scenery, with a visit to Sliabh Liag, the highest sea cliffs in Europe, at the top of most visitors must-sees. Killybegs is Ireland’s busiest fishing port, and also has the reputation for its abundance of gourmet restaurants which operate in the town and locality, many offering fabulous seafood. Beach lovers and watersports enthusiasts will not be disappointed, with so many beautiful sandy beaches to choose from. For all outdoor sports this is an area worth visiting, with sea angling, dive charters and sightseeing boat trips all available locally. Visit the Folk Village Museum at Glencolmcille and the traditional weavers and hand knitting centres for which this area is known. Shop, pub and restaurant 500 yards. All on ground floor: Living/dining room with patio doors. Kitchen. 2 double bedrooms, both with en-suite shower room and toilet. Oil central heating, electric and bed linen included. Freeview TV. Electric cooker. Microwave. Washing machine (in garage). Large garden with patio, sitting-out area and furniture. Shared unspoilt grounds with patio and sitting-out area. Parking (2 cars). Cycle store. Welcome pack. No smoking. Holidays at Atlantic View House run from Saturday to Saturday. For a better idea of where Atlantic View House is, you can see Atlantic View House on the map below. Do you want to holiday near Atlantic View House (W32033), you can see other cottages within 25 miles of Atlantic View House; have a look to find your perfect holiday location.